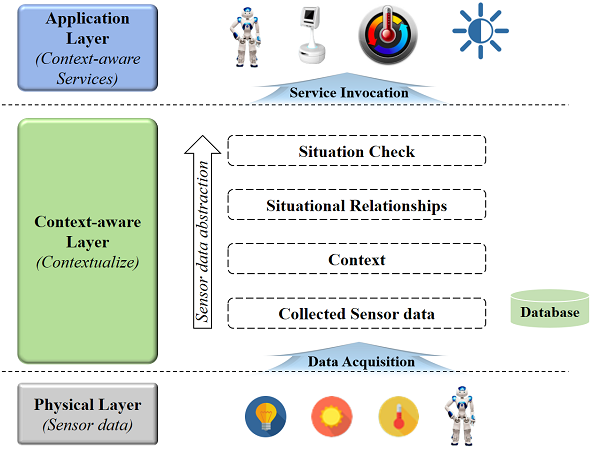 A context-aware system is required for providing context-aware services to users in the Internet of things (IoT) environment. It consists of three primary tasks: gathering context data, abstracting the collected data, and providing services to users. In IoT environments, context data are generated by a large number of sensors, and this context data are part of the context-awareness services provided to the users. When the context-aware system provides context-aware services with their service descriptions, it is necessary to process the data gathered by abstracting and contextualizing them. Generally, the context-aware system encounters a problem in that the context representations between contextualized sensor data and their related service descriptions do not match well. We herein propose a context retrieval method that facilitates in obtaining context information for the context-aware system in IoT environments. The context-aware system communicates with an ontology module that handles input data described in a set of universal resource identifiers, as a triplet. The ontology module resolves each representation request from the context-aware system. The proposed method provides an ontology-based mapping procedure for the context representation problem described above. B. Morin, N. Harrand, and F. Fleurey, “Model-based software engineering to tame the IoT jungle,” IEEE Software, vol. 34, no. 1, pp. 30-36, January 2017. F. Zambonelli, “Key abstractions for IoT-Oriented software engineering,” IEEE Software, vol. 34, no. 1, pp. 38-45, January 2017. M. A. Razzaque, M. Milojevic-Jevric, A. Palade, and S. Clarke, “Middleware for internet of things: a survey,” IEEE Internet of Things Journal, vol. 3, no. 1, pp. 70-95, February 2016. S. Breiner, E. Subrahmanian, and R. D. Sriram, “Modeling the internet of things: a foundational approach,” Proc. of the Seventh International Workshop on the Web of Things, November 2016, pp. 38-41. A. Ikram, A. Anjum, R. Hill, N. Antonopoulos, L. Liu, and S. Sotiriadis, “Approaching the internet of things: a modelling, analysis and abstraction framework,” Concurrency and Computation: Practice and Experience, vol. 27, no. 8, pp. 1966-1984, October 2013. X. H. Wang, D. Q. Zhang, T. Gu, and H. K. Pung, “Ontology based context modeling and reasoning using OWL,” Proc. of the Second IEEE Annual Conference on Pervasive Computing and Communications Workshops, pp. 18-22, 2004. S. Bechhofer, “OWL: web ontology language,” Encyclopedia of database systems, pp. 2008-2009, 2009. M. Junghanns, A. Petermann, M. Neumann, and E. Rahm, Management and analysis of big graph data: current systems and open challenges, Handbook of Big Data Technologies, pp. 457-505, 2017. S. Harris, A. Seaborne, and E. Prud'hommeaux, “SPARQL 1.1 query language,” W3C recommendation, vol. 21, no. 10, 2013. D. Calvaresi, D. Cesarini, P. Sernani, M. Marinoni, A. F. Dragoni, and A. Sturm, “Exploring the ambient assisted living domain: a systematic review,” Journal of Ambient Intelligence and Humanized Computing, vol. 8, no. 2, pp. 239-257, April 2017. K. Suri, W. Gaaloul, A. Cuccuru, and S. Gerard, “Semantic framework for internet of things-aware business process development,” Proc. IEEE 26th International Conf. on Enabling Technologies: Infrastructure for Collaborative Enterprises(WETICE), IEEE Press, pp. 214-219, 2017. M. Alirezaie, J. Renoux, U. Köckemann, A. Kristoffersson, L. Karlsson, E. Blomqvist, N. Tsiftes, T. Voigt, and A. Loutfi, “An ontology-based context-aware system for smart homes: e-care@home,” Sensors, vol. 17, no. 7, pp.1586, 2017. Y. Park, J. Choi, J. Choi, and Y. Cho, “Conceptual metadata model for sensor data abstraction in IoT environments,” International Conf. on Advanced Control, February 2018.